When in the market for an SUV that performs well, people choose the Edge ST. The vehicles are also prized for their roomy interiors and stylish good looks. Our Boise inventory includes the latest models. Stop by. Take a look. Go for a test drive. 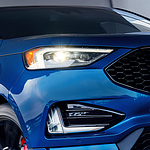 The five-passenger Edge ST comes standard with a 2.7-liter turbocharged engine that has a fuel rating of 19 mpg in the city and 26 mpg on the highway. The boosted engine also delivers 335 horsepower and 380 pounds of foot torque. The vehicle also has an eight-speed automatic transmission. The sport mode provides a greater driving thrill. While in this mode, the Edge ST changes gears faster, which enables more responsive acceleration. Hear the engine rev and enjoy the ride. If in the need of an upgraded vehicle, make a point of venturing to our Lithia Ford Lincoln of Boise location and see what the Edge ST offers.